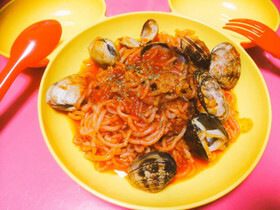 Arrabiata Style Konnyaku Pasta. This spicy tomato sauce is easy and healthy way to enjoy your pasta. Arrabbiata sauce, or sugo all'arrabbiata in Italian, is a spicy sauce for pasta made from garlic, tomatoes, and dried red chili peppers cooked in olive oil. 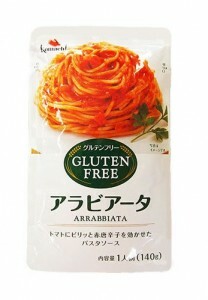 This ready-made Arrabbiata sauce is Gluten Free certified by GFCO (Gluten-Free Certification Organisation) which has one of the strictest standards in the US. This spicy tomato sauce is simple but the best way to enjoy your pasta. And to make it even healthier you can replace the pasta with konnyaku noodles! Try this Arrabiata style konnyaku pasta recipe! 1. Prepare the konnyaku noodles. Bring water to a boil in a pot, put in the konnyaku noodles. Then remove from the heat, let the noodles rest for 7 minutes. Drain the konnyaku noodles in a colander and rinse them under the tap with hot water (this rising in necessary to remove the tapioca syrup coating). 2. Warm up with the closed packet in boiling water for 3-4 minutes, or open the sauce and pour in a bowl, and warm up for 1-1.5 minutes in the microwave with saran wrap on. 3. Pour the sauce on the konnyaku noodles. 4. If you want to add vegetables or clams, put konnyaku noodles and the sacue into a pan and cook on medium heat to 4-5 minutes.